The Nokia Lumia 1520 has a brand new version of Nokia's PureView camera line. It uses a 1/2.5" sensor with 20MP resolution. To put that in context, the sensor has 15% smaller surface area than the 20MP 1/2.3" sensor in the Xperia Z1. It is certainly smaller than the Lumia 1020 sensor too and the ZEISS lens has a narrower f/2.4 aperture (compared to f/2.2 on the 1020). There's no xenon flash either, all of which should affect the low-light performance. Still, the good news is that Nokia managed to keep the optical image stabilization and the dual-LED flash is stronger than the common single-LED units, so the Lumia 1520 should still be competitive against other devices in the dark. Those are questions, which are best left for the review, however. 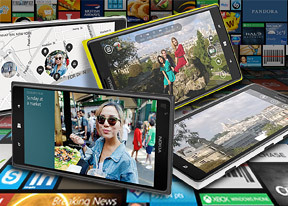 Nokia has created a special app for its flagship Lumias dubbed Nokia Pro Camera. Being one of the phone's key software features, it's there to compliment the PureView camera with a simple user interface that allows users to fine tune the camera settings. It may sound intimidating, but Nokia has done a great job of making the app simple to use for both novices and professionals alike. Starting the Nokia Pro Camera reveals a familiar interface, first introduced with the Smart Camera app. The important distinction is the transparent box in the top center with six camera settings. From left to right they are flash, white balance, focus, ISO, shutter speed and exposure compensation. Tapping on each of them opens a ring-based interface on the right side of the screen. You can access all of them simultaneously by sliding the on-screen shutter button to the left. This will stack sliders for all six settings next to one another allowing you to easily fiddle with them at the same time. The settings you modify are kept at the values you chose, with the others adjusted accordingly by the software. We really like this interface - it's intuitive and powerful at the same time. One major complaint about the Lumia 1020's camera is how slow it is to save photos. We're happy to report the Lumia 1520 camera is a significant improvement in this respect - it's clearly faster. As we mentioned earlier, the Pro Camera lens has another cool trick up its sleeve. It snaps two photos at once - one in full resolution (16MP or 19MP depending on the chosen aspect ratio) and another one in 5MP, which benefits from the pixel oversampling technology, while at the same time being far easier to share. You can zoom in up to around 2x in the 5MP shots, the exact number changes based on the resolution and therefore the aspect ratio. Pro Camera also comes with a brand new option - shooting in RAW. It's DNG - digital negative - format developed by Adobe, which has wide support in photo editing software. While casual consumers will probably stick to JPEG, photo enthusiasts can work wonders with a RAW file - since there's no software processing or JPEG compression applied, editing RAW files gives you more headroom for editing than a JPEG image. Keep in mind that those files are around 20MB big, while a full-resolution JPEG is around 4MB, the 5MP JPEGs are a mere 1MB. RAW files cannot be viewed by most apps either (e.g. web browsers) without processing, which is another thing to keep in mind if you want to share photos. The latest version of the app also has the Nokia Smart Camera suite, so you don't have to switch from one app to the other to get the cool effects. The Nokia Pro Camera app isn't limited to shooting still images, it can capture video too, and does quite well. Tapping the video icon at the bottom gets you to the video part of the app. There you have access to just the relevant settings: flash, white balance and focus. The focus can be set to either manual, auto or infinity. Video recording also makes use of OIS and oversampling. Zoom is enabled even during video capture and it can go up to 3x in 1080p mode and up 4x in 720p mode. The 1080p videos are recorded at 30fps, but you can pick 24fps and 25fps too. The Nokia Lumia 1520 has a total of four mics (two at the front, two on the back) with the company's proprietary Rich Audio Recording for distortion-free sound recording in loud environments. These can be used for another intriguing feature as well - it's dubbed Directional stereo. When you enable it, the sound in front of the camera is recorded clearer than the rest, potentially dealing with unwanted noises in your video and enhancing a subject's voice. We'll leave the detailed image quality analysis for the review, but for now you can check out these official camera samples plus one we snapped ourselves (the last one). Nokia has a number of cool camera lenses, which we've covered before and are exclusive to the Lumia line, but the most interesting one is the new Refocus lens. It snaps several photos at different focus points and allows you to interactively change the focus of the image after the fact or bring the whole image in focus. Best of all, these images are easy to share (including Facebook support), unlike some other proprietary camera apps that lock you into the maker's ecosystem.